Well, there’s a lot to unpack in that. There’s no CHIP renewal for Christmas, but at least we can see your party’s priorities more clearly. 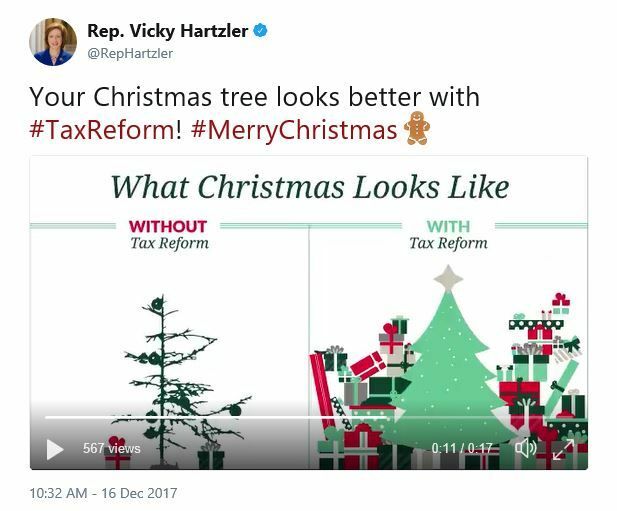 My Christmas tree is suffering from lack of infrastructure funding, climate change and a Republican Party that thinks punishing poor people is somehow compatible with Christian morality. Luke 12:33 “Sell your possessions and give to the needy” . Your literally using a Christian holiday to take from the poor and give to the rich while promoting consumerism. Charlatan. Better to read the Bible than thump it my friend. Ugh…. wow. That’s quite a way to sell out your constituents. My tree will really be complete when I add the #TeamTreason ornaments. ‘Tis the season for a whole lotta treason! #holycrap that is so freggin’ cognitively dissonant that I am impressed with both your shear stupidity, boldness, and unquenchable greed. you are proof that jesus christ’s existence never mattered! Nobody wants this, you tone-deaf fool. This is the most moronic comparison I’ve ever seen. You never get tired of the lies, do you? Elections are coming. Soon you’ll be gone. That’s when we’ll really celebrate. You truly sickening me. Christmas is Jesus’ birthday, not an excuse to go buy a bunch of s*** nobody needs. Crawl back in your hole I’ve had enough of you this weekend.